I had been planning a ride for some time. 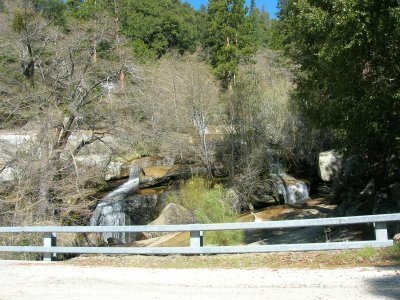 I had done portions of this ride in the past, and wanted to piece together a mighty loop, taking in the absolute best of the southern Sierra Nevada. This would be a ride to rival the Cannell Plunge, yet not require the horrendous shuttle up to Sherman Pass. As you can see in the maps above, I had been very busy with Topo!, plotting and measuring. It was an exercise akin to spec'ing out your dream truck at the Ford website - I knew full well that many features of this ride were projected wishful thinking. After all, it was only mid spring, and there was a good chance the snow would not allow for portions of the ride to be completed. I also had some help, and many 'teaser' pics, in the form of an excellent website, Mountain Bike Bill. The plan was hatched when I started to try to connect, on map, the Portugese Pass area with points north. Eventually my wandering eye roved north to the Great Western Divide Highway, where I'd done some riding before. Mountain Bike Bill had two rides listed in this area, both in the neighborhood of Quaking Aspen Campground, near Camp Nelson. One trail, the Summit Trail, sounded iffy by Bill's description. The other, the Freeman Creek Trail, sounded like a natural piece to the loop I had in mind. Another segment of the Summit Trail, south of Quaking Aspen, looked like the perfect zenith of the loop. Topping out at over 9300' and promising a full 8 miles of prime singletrack up and over Slate Mountain, this simple black line on a map caused my heart to skip a few beats. Out before dawn, I got to witness some beautiful morning alpenglow on snowy Frazier Peak and Mount Pinos, then dipped into the southern end of the San Joaquin Valley. Bakersfield bound. Isabella, Wooford Heights, Kernville, Fairview...JOHNSONDALE!!! Feels like home. My buddy Gary and I used to hang out up here rock climbing and fishing a lot. Not much has changed since those years, except now half the trees look like used matchsticks. This was Ground Zero for the McNally fire. I'd seen some of the aftermath riding the Cannell Plunge a few years ago, but I had no idea the fire had spread this far north and west. It was a sad sight, but the ash was giving rise to a kick-a$$ wildflower bloom. 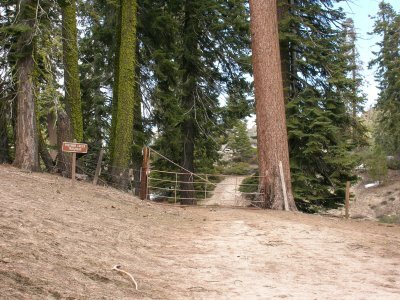 I parked a few hundred yards south of Camp Whitsett, at the start of the road to Last Chance Meadow. This was a part of the loop I'd done before. 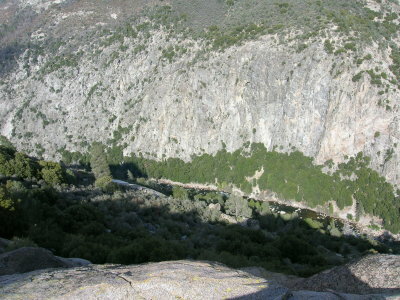 It's a beautiful climb up through huge granite domes that dot this region of the Kern. I crossed a bridge over Nobe Young Creek where it cascades over granite slabs and kept climbing into a puffy-cloud blue-sky day. The road gets steep just before Last Chance Meadow, then mellows for a wander through a shady grove before hitting the Great Western Divide Highway. I made a right, north, on the higway and soon met a ranger headed south. We gabbed for a bit, and I got the feeling he was trying to hint at something. I knew the road was closed, and he was making a big deal about why I wasn't seeing any traffic. We bid eachother farewell, and then he came out with it... "Don't let the Highway Patrol catch you up here. They'll give you a ticket! But I don't think they'll be around any more today." Hmmm. I hit the Crawford Road up to Windy Gap and made a left, now headed west. The road got steadily mushier with snowmelt, and then patches began to appear. About 0.5 mile past Nobe Young Meadow the snow got consistent enough that I decided to leave the Slate Mountain portion of the ride for next time. I found a nice sunny spot and had a little breakfast. Then, back to the highway. I really burned rubber up the highway, standing and hammering for extended stints. That's not an easy thing for a flatlander at 7000' elevation! Soon I had a spectacular sight before me. 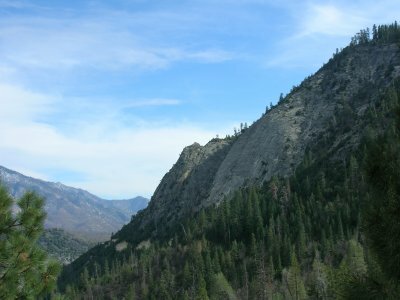 The spherical profile of Dome Rock came into view, with a snow-plastered Olancha Peak visible in the distance, far across the Kern River. Gads, what a view! I passed by the road down to Dome Rock, noting that there were fresh tire tracks there, and kept spinning. Then I passed the road closure at Ponderosa, looking back at the signs and pretending to be surprised, lest some CHP officer was scoping out the scene. The road rolled up and down some more, then descended through aspen trees still bare of spring buds. 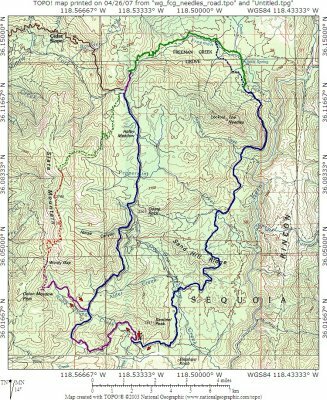 When I got to Quaking Aspen Campground, I made a right and headed again north towards the Freeman Creek Trail. This was one of those rare trails in the Sierra Nevada that is explicitly signed as bike-friendly. And, indeed, it was. The trail was nice and wide, but not too much, and swooped through the fir trees and over creeks on well-built bridges. 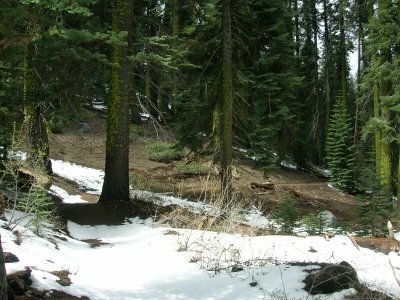 There was still a bit of snow, and I walked a bit through the slush, but gradually the trail cleared. I stopped for lunch in an incredible grove of white fir trees covered in heavy coats of moss. Lounging on a rock in the sun, surrounded by quiet forest, I almost dozed. After lunch, I continued down the trail and... HOLY CRAP! That's a BIG frikken tree! 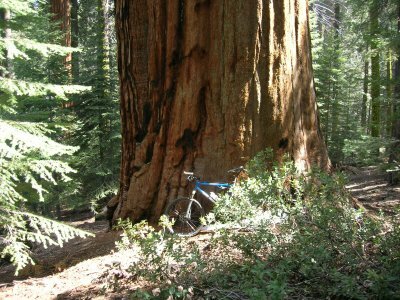 Over the next couple miles, I'd round a corner in the trail and nearly fall off the bike as I came upon larger and larger sequoias. Most of these giants predated the rise of the Roman Empire. A couple select specimens were nearly as old as the Chinese calendar. 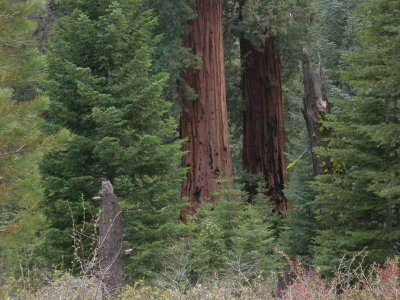 Stunning and humbling, almost frighteningly big, these trees were simply a shock to see. After a while of being repeatedly shocked and awed, I came across perhaps the second biggest tree I'd ever seen in my whole life. This thing was a monster! 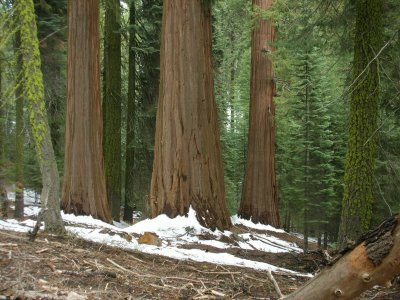 The only tree I'd seen that was bigger was maybe the General Sherman Tree in Yosemite's famous Mariposa Grove. I put my bike against it to get a shot with a little perspective. Having been forced to contemplate the utter brevity of human life, I continued my descent to the George H. W. Bush Tree. This tree was dedicated to the supreme war profiteer himself, who stooped low and 'preserved' this grove for future generations, probably to soothe what little conscience he has. In protest, I declined to photograph the Bush Tree, and continued on my merry way. 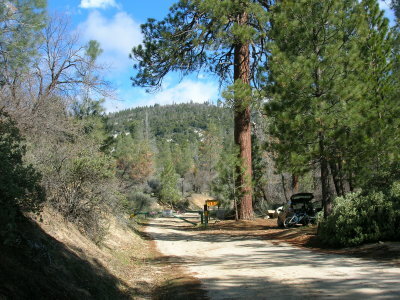 Across the road, the Freeman Creek Trail continued on past Pyles Camp. This section, though a bit more sandy, had a more wild character and was a little more fun in places. Gradually the trail began to climb past Pyles Camp on it's return to the road. I had to cross the creek in a few places, and braided cowtracks caused me some confusion. Trails were everywhere! I lost the 'official' trail and hit the road 100 yards north of where I should have, but it's all good. Now all I had was the final road session back to the car. This was familiar terrain. I'd driven this stretch many times by car, and biked it twice. 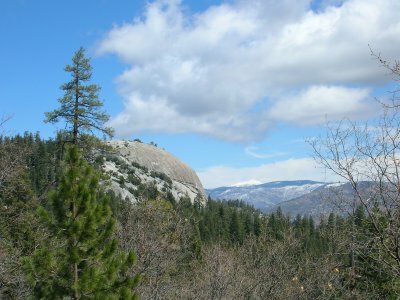 I couldn't wait to get to my favorite rest stop, a huge rock outcrop 1200' above the Kern River, at the foot of the magnificent Voodoo Dome. Along the way, I passed beneath Merlin Dome, the only dome in the Needles group that I've actually climbed. After a snack break in the sun, overlooking the Kern River, I hacked out the final few miles back to Camp Whitsett, enjoying the wind-down of the easy pavement, soaking up the last little bit of Kern River scenery before twilight. Though it cost me a few extra bucks gas money, I avoided the traffic and drove out through Alta Sierra and down the 155 into Delano, where I picked up the 65 into Bakersfield and on to home. Though I didn't complete the loop I'd planned, this was certainly one of the finest days I've spent in the mountains. 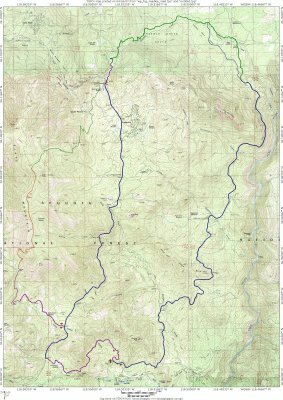 I'll call this a recon, for now I know where to go for the best loop in the Southern Sierra. "Life is unfair. Kill yourself or get over it." © 2006-2013 MBPost.com. All Rights Reserved.